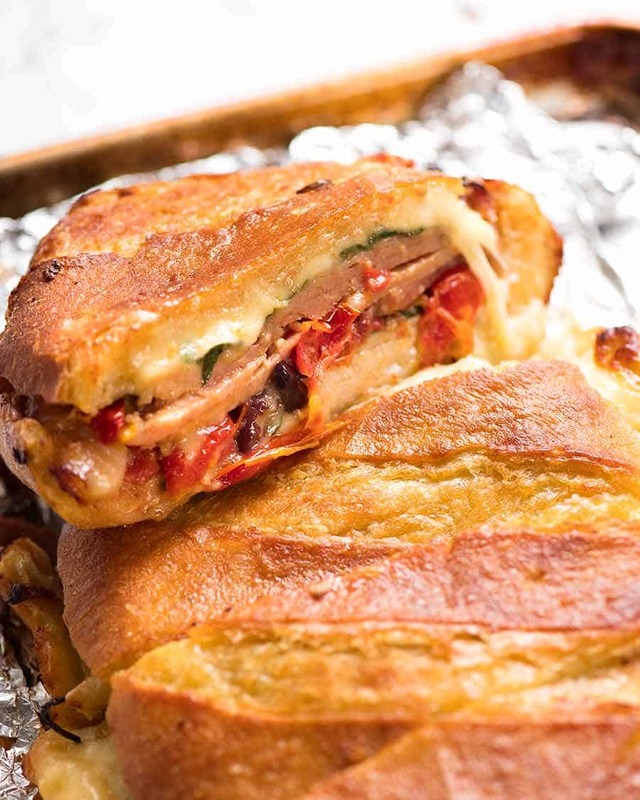 Here’s an epic way to use your Christmas leftovers – make a toasted bread bowl sandwich! Perfect portable food, this is certainly not your average sandwich. Crispy and buttery on the outside, mine is stuffed with Christmas leftover ham, turkey, spinach, antipasto type things and cheese. But anything goes! Anything goes in this bread bowl sandwich! Christmas Leftovers are precious around these parts. It only rolls around once a year, and everyone in our family really makes an effort with their allocated dishes. So quite often, you’ll find various family members sidling up to the leftover ham or whatever dish took their fancy in particular that year to pack themselves a generous quantity of it before all the remaining leftovers are shared out equally and fairly to everyone. So. When it comes to consuming leftovers in any form other than reheating it as is, it needs to be worthy. I promise – this bread bowl sandwich is worthy! This is somewhat different to your usual sandwich. I call it a bread bowl because it’s made by hollowing out a bread loaf (use the leftover bread for Meatballs!) then filling it with all manner of things (Christmas leftovers in this case) before popping the lid back on, weighing it down with something heavy (I use a cast iron skillet) then baking it until it’s toasty. The bread bowl shape isn’t just a “hack”. 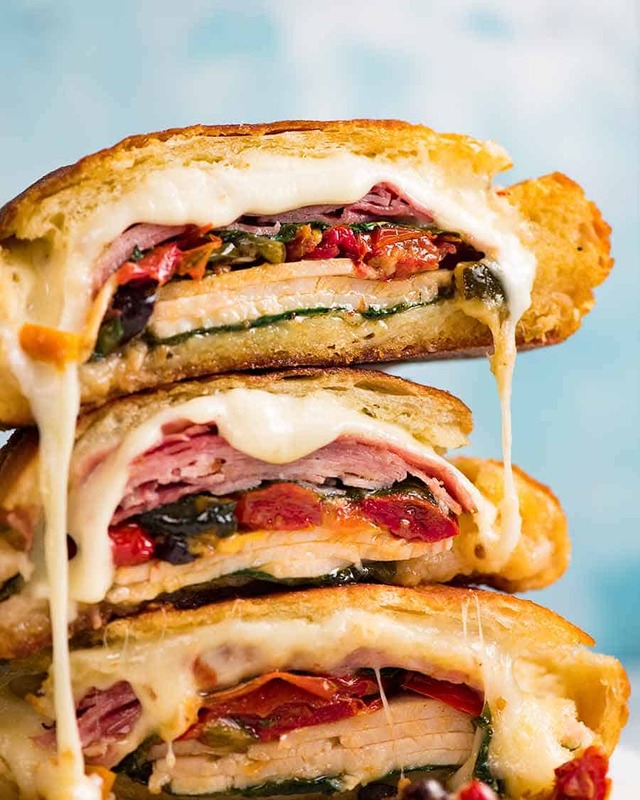 It allows us to stuff this sandwich with way more things than you can between 2 slices of bread. It holds all that goodness in when we weigh it down while it bakes so all the flavours meld together and it makes the crust super crispy. The filling – there are no rules! Anything goes here. Leftover ham, turkey, pork, roasted veg, cheese, fresh salads. You’re only restricted by your imagination! I probably wouldn’t use medium rare cooked meats like Prime Rib or Roast Lamb because it seems like a bit of a shame to cook a meat to perfect blushing pink only to cook it through in this Bread Bowl Sandwich. But other than that, I can’t think of many things that would make our Christmas table that I wouldn’t put inside a Bread Bowl Sandwich. See above the video for an extensive list of ideas! This is the sandwich that I make to share with friends and family on international flights because it travels so well and is made for sharing. It’s one of those foods that’s terrific fresh out of the oven OR the next day because the flavours have had time to meld even more. Granted, I don’t usually make this with Christmas Ham!! 😂 This special Christmas edition Bread Bowl Sandwich is a once a year thing. And to be honest, the video plus some of the photos had to be shot with deli turkey and ham because I ran out of leftovers from this years’ Glazed Ham and juicy Roast Turkey. So usually, I make this Bread Bowl Sandwich with deli cold cuts. 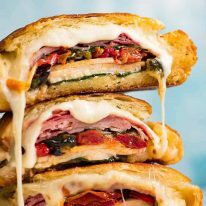 And actually, this recipe is based on an Italian sandwich called Muffuletta which is made the same way but usually using a round bread loaf and of course, Italian cold cuts and antipasto things. PS The two photos below are the version made with actual leftovers from this Brown Sugar Glazed Ham, this juicy Roast Turkey and leftover antipasto-y things from this Festive Italian Cheese Log. BROWSE ALL CHRISTMAS LEFTOVER RECIPE IDEAS! FILLING IDEAS – LEFTOVER CENTRAL! ANY cooked meats that aren’t too saucy. 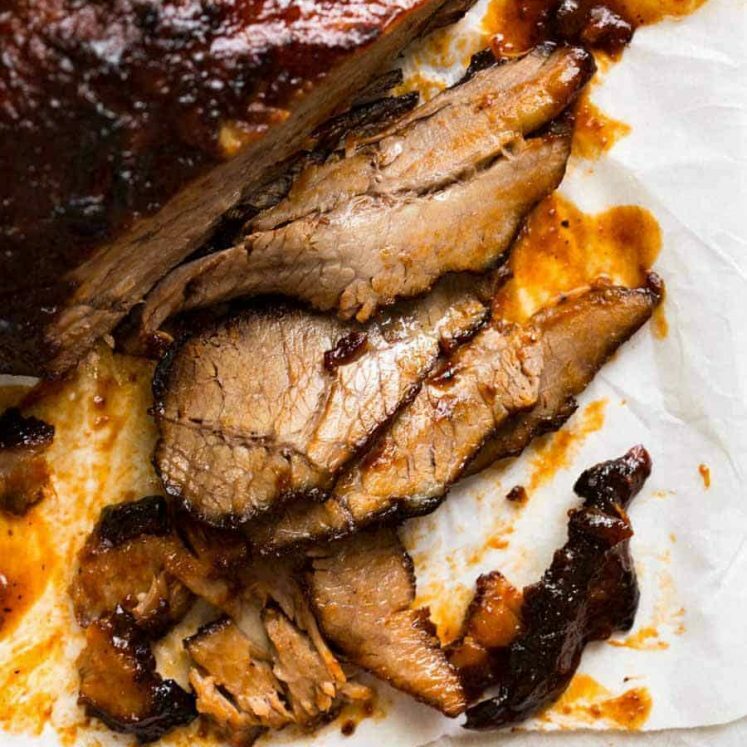 Not just sliced roasts (pork roast, honey butter pork loin, roast chicken, turkey) but also chopped up or shredded cooked meat (eg Greek Chicken, Pork Carnitas, BBQ Pulled Pork, Mexican Shredded Beef) or even Meatloaf, Rissoles or Meatballs! Greens – baby or normal spinach are my favourite, followed by rocket / arugula. If I use tomato or other juicy vegetables, I slice them, shake off excess water then wedge them in the middle (don’t want to make the base soggy). I also use leftover cabbage salad (wring out excess liquid). Cheese – Not just melty cheese, also feta, goats cheese, ricotta (SO GOOD! ), even a sprinkle or shavings of parmesan! Roasted and other cooked veg – SO GOOD. Pretty much anything – pumpkin, Brussels, carrots. I have even been known to spread the base with a layer of mashed potato. Canned veg – I’ve done corn and beans in the past when I made a Mexican style one with Mexican Fiesta leftovers! 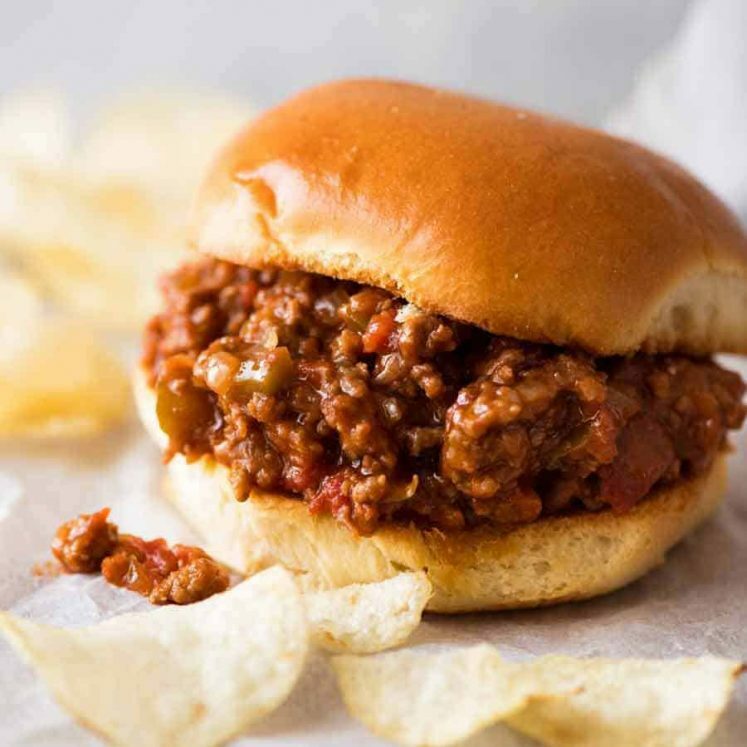 Browse all Sandwiches & Sliders recipes – and Burgers! Recipe video above. This isn't really a recipe, it's more of an idea you can make your own. 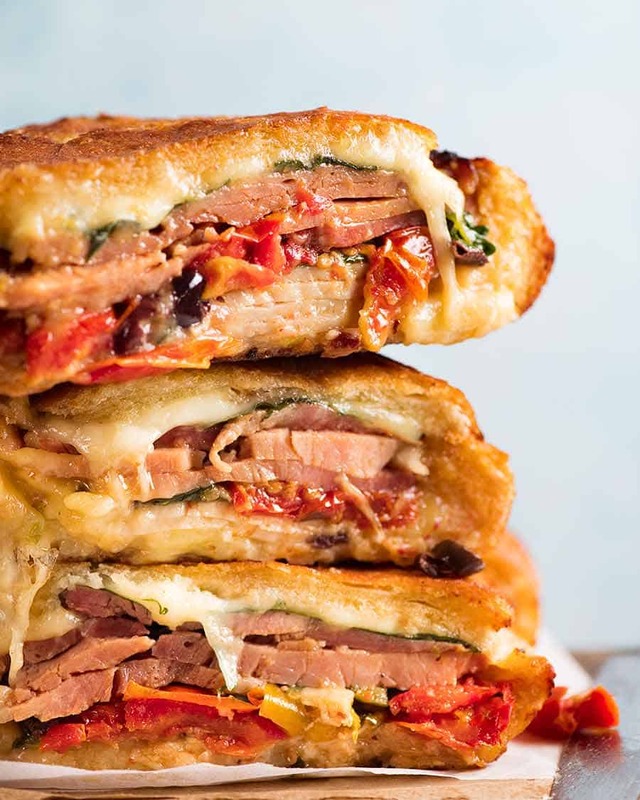 A way to completely transform leftovers into an epic sandwich for sharing! Use leftover ham, cooked meats, roasted veg, cheese platter leftovers. Imagine the possibilities! Great served fresh AND travels well! Cut the top off the bread loaf. Pick out bread from the loaf and the lid, leaving a wall and floor about 1.5cm / 3/5" thick. 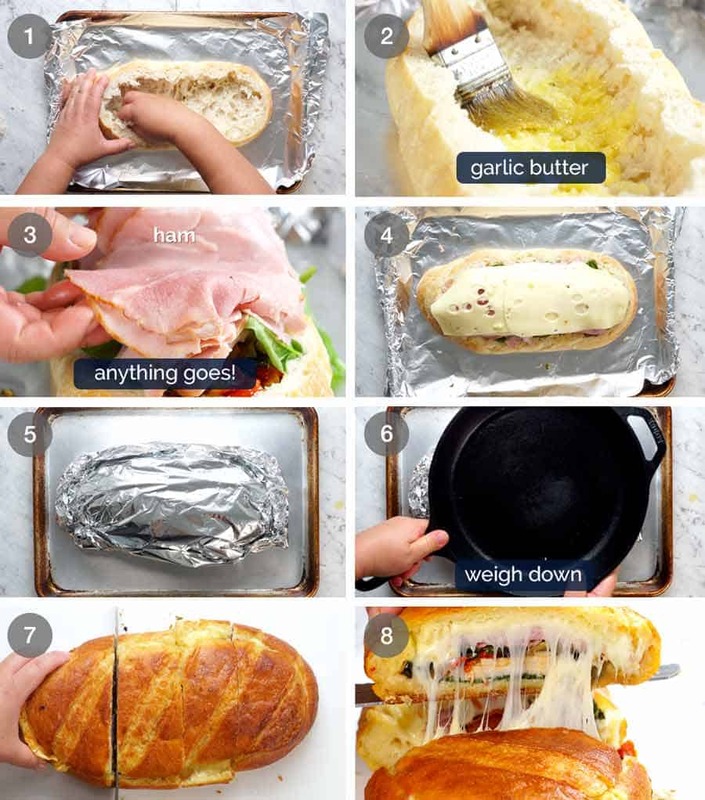 Place bread on a large sheet of foil on a baking tray. Dab / brush inside with butter. Layer with: half spinach, turkey, antipasto things, remaining spinach, ham, cheese. Tuck flappy bits inside the loaf, top with lid. Brush with butter all over. Wrap with foil. Weigh down with something flat and heavy - cast iron skillet is ideal. Bake for 20 minutes. Remove skillet and foil. Bake for a further 10 minutes until golden. 1. Bread - any type of bread will work just fine but artisan style breads like sourdough, ciabatta and similar work best because they will hold together better and get a better crust so it's easier to hold and eat. 2. 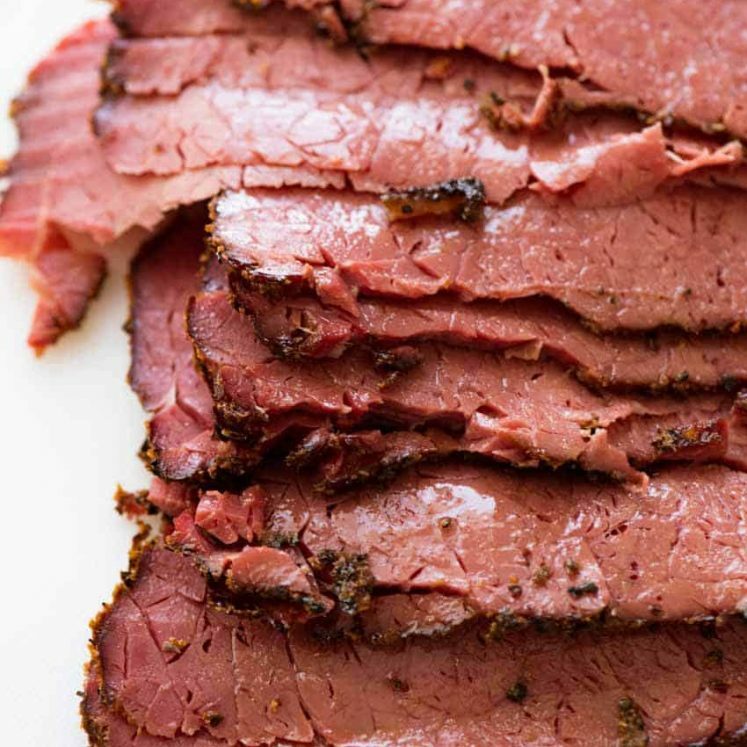 Make ahead - I've made this several times using deli cold cuts to take on flights! It puts aeroplane food to shame 🙂 Make it the day before, and bake. 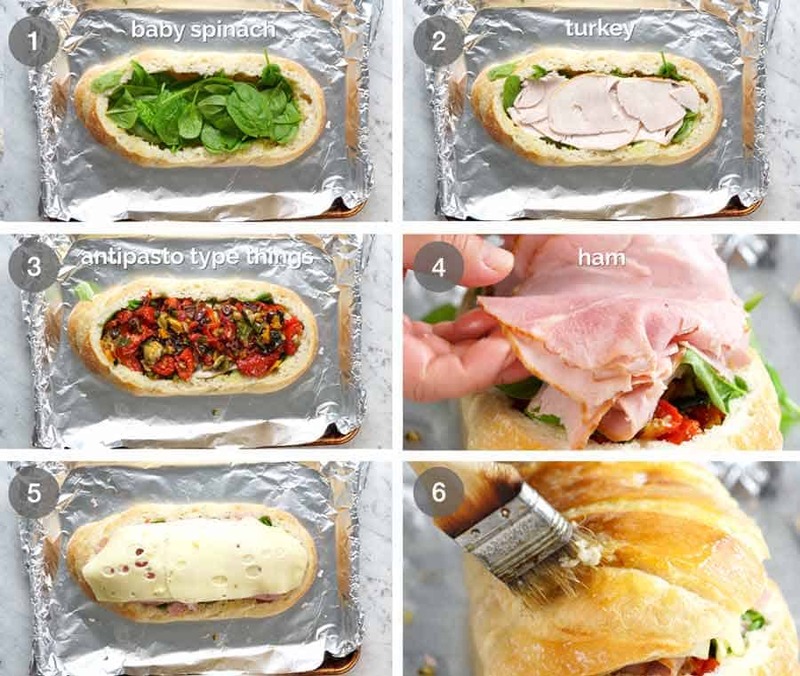 Wrap it up with foil again while warm, let cool then refrigerate. 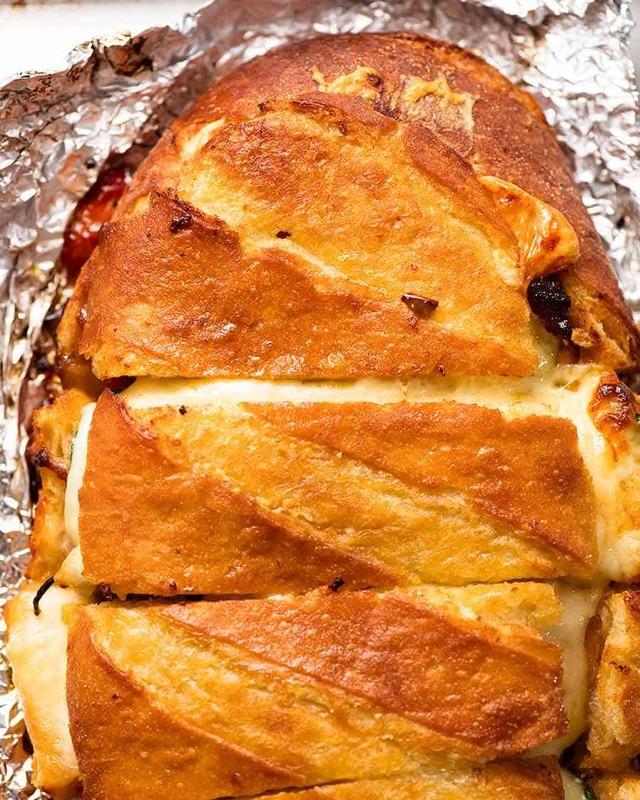 The flavours meld overnight and makes it even more amazing so you don't miss the melty cheese (promise). Consume at room temp for best experience! 3. Leftover Bread - Use it to make Italian meatballs! I use fresh chopped bread to make most of my Meatball recipes - it's the secret to extra soft and juicy meatballs! 4. Filling Ideas - see above the video in post for an extensive list of ideas. Think beyond the obvious - this can be made with almost ANY leftovers! 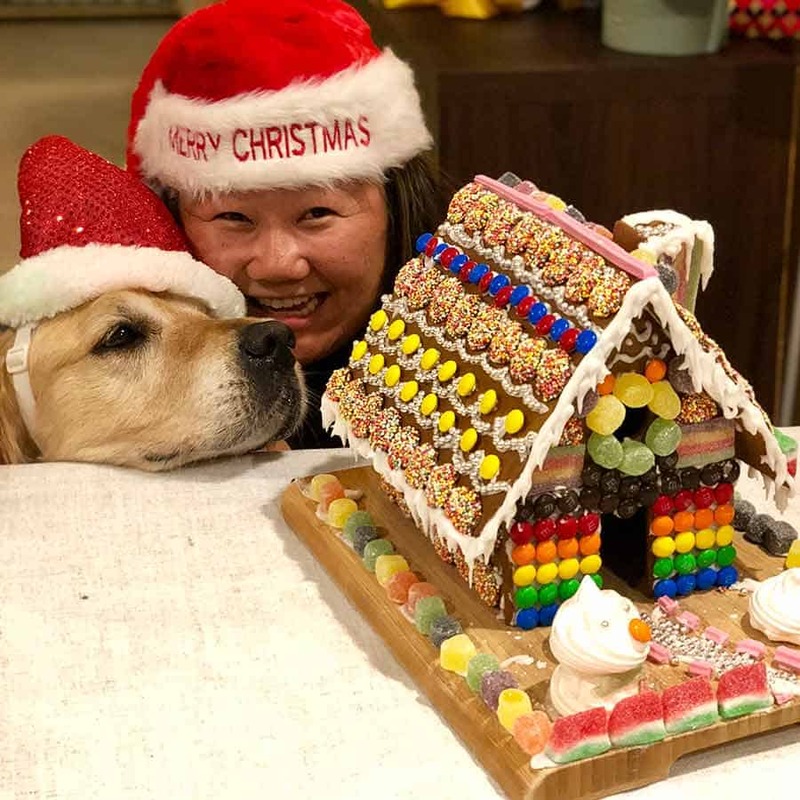 When Dozer (and I) spotted the gingerbread house…. Dammit I’m drooling again… happy new year Nagi from Cathy and Sparky!